Concepts: Odin’s Ravens is a two-player racing game. Each player takes the role of one of Odin’s flying messengers Hugin or Munin, and are set with the task of traversing the land and returning home. The first to do so is the winner. The concept here is very straightforward – the land itself is set out by drawing from a deck of cards, each of which has a track at the top and bottom of each card. Placing these cards down creates a circuit for the players to race through, a process which is aided by means of additional ‘Loki’ cards that grant benefits to the player. Writing: The game itself is clearly laid out and explained. Cards tend to utilize images rather than text, with different lands having a distinctive colour hue, which means that people with visual impairments should have less difficulty in knowing which locations are which. The rules themselves are included in a booklet which is written in clear fonts and with enough examples in-play that allow the players to dive right into the gameplay. 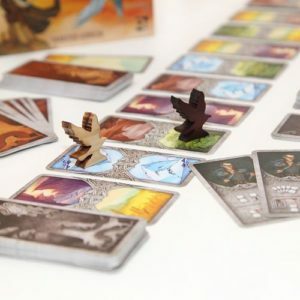 Mechanics: As a two-player game, Odin’s Ravens emphasises a head-to-head gameplay style in which both players try to complete a circuit around the land cards. Each player moves in the opposite direction to their rival, playing ‘flight cards’ from their hands to enable them to move. Players can only move through lands that they possess enough flight cards to enable them to do so – if you do not have a desert flight card, you cannot move through the desert until you can play the cards that would allow you to do so. On each player’s turn, they have the choice of playing one of several ‘Loki cards’. These allow the player to make special moves or actions, such as moving land cards around on the track or granting special benefits that would increase their speed (often at the expense of the rival player). But remember that the track is cyclical – if you make the terrain more difficult for your opponent early in the game, you may struggle with it when you get to that part of the track yourself. Design: The aesthetic design of Odin’s Ravens is beautiful. Each card is backed with lovely and evocative artwork. The box itself is neatly designed and even the player pieces are atmospherically designed. The game makes strong use of the Nordic atmosphere, whilst at the same time being tasteful and charming. 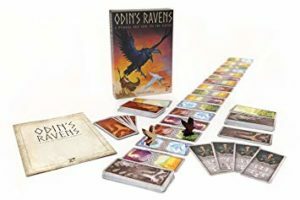 Playability: Overall Odin’s Ravens plays very nicely. It has a good sense of challenge and strategy to it, and allows for two players to go head-to-head in a racing game. The atmosphere in it is stylish and the variety of options that the Loki cards provides allows for just the right amount of flexibility. However at the end of the day it still feels that there is something missing from Odin’s Ravens. 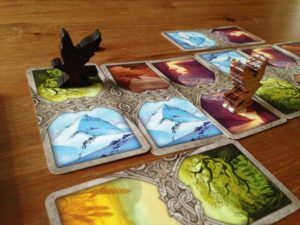 The way in which flight cards are played does feel rather flat, and that means that while the players are trying to out-race one another, without the inclusion of game-changing Loki cards, it can feel a little uninvolved. When we played Flamme Rouge last year, we noted with satisfaction how the cards made use of exhaustion cards, creating an ebb and flow to the gameplay which made the racing mechanic exciting. If there were something similar to that included in Odin’s Ravens, it would encourage significantly more replay value. Instead we find that the game tends to simply sit on our shelves, which is a real shame. Conclusion: For what it is, Odin’s Ravens is a lovely game. It’s accessible, enjoyable and playable, and is certain to give a few hours worth of entertainment. For the price of the game, you’ll find it to be very good value. If you are looking for a small and portable two-player racing game, I would recommend this. But at the same time, there are other games that fulfil much of that criteria in a stronger way. If you want an involving head-to-head two-player game, you might find Mr Jack to be more of a challenge of minds. If you want a more exciting racing experience for more than two players, Flamme Rouge is the game for you. Both games are, however, quite a bit bigger than Odin’s Ravens, so maybe we shouldn’t judge this game for what it isn’t, and appreciate it for what it is. FINAL THOUGHTS: A lovely game that promises hours of distraction, boasting a well-crafted aesthetic and fun strategy that only falls short of brilliance in what it does not quite bring to the table.